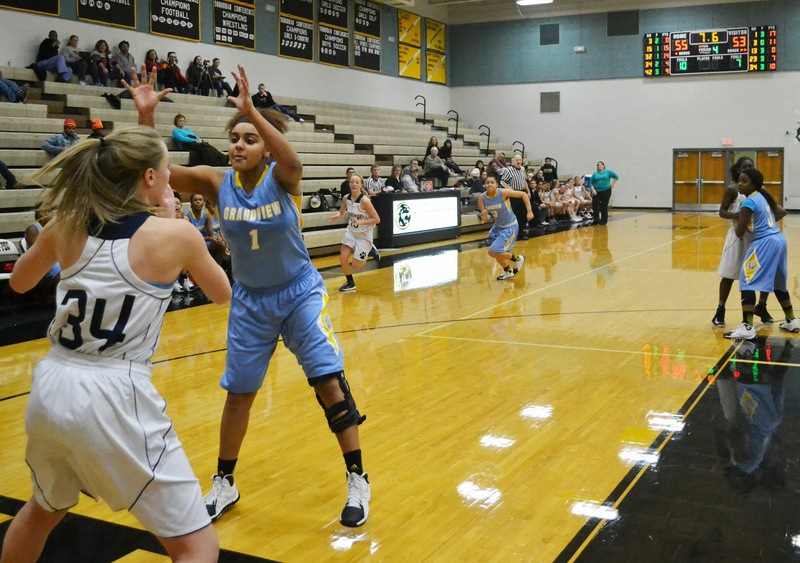 Drea Lesure’s desperation three-point attempt as time expired missed the mark, and the Grandview Lady Bulldogs lost for the first time this season in a 55-53 defeat at the hands of William Chrisman last Friday night in the Ray-Pec Sonic Classic. The sides battled back and forth throughout, and neither team finished a quarter with a lead greater than three points. But the Lady Bulldogs failed to execute late, and Chrisman attacked the basket relentlessly to take the win. Each team had moments where they appeared on the verge of taking over. In the first quarter, Grandview went down 14-8 before Moore called a timeout to re-focus his team. The Lady Bulldogs had been flummoxed by the Chrisman press early, and had been careless with the ball. But they came out of the timeout energized, and freshman point guard Zoie Reynolds quickly nailed a three-pointer. Freshman center Nataya Partee finished a transition lay-up in the quarter’s closing seconds to bring the Bulldogs within one point, at 14-13. From there, Grandview continued to streak. Sophomore Carlee Bidondo and Reynolds hit layups, and senior Alex Dobbins sunk two mid-range jumpers to cap off a 16-2 run. By the time the streak was over, the Bulldogs held a 24-16 lead. Much like the Lady Bulldogs in the first quarter, though, Chrisman fought back in the closing moments before halftime, finishing the second quarter with a 5-0 run to bring the count to 24-21, Grandview. The Lady Bulldogs came out of the half firing on all cylinders, and held as much as an eight-point lead in the third quarter. Dobbins once again got some good looks to help extend the lead, finishing strong around the rim. She finished with 17 points, leading the Grandview attack, but even then Moore felt his team should have found more ways to get the dynamic senior the ball. Chrisman roared back with a run of its own to conclude the third quarter, getting to the rim easily as Grandview dealt with foul trouble. By the time the fourth quarter began, the Lady Bulldogs held just a 40-39 lead. consecutive free throw attempts, two of which were the front end of one-and-one opportunities. Meanwhile, Chrisman remained steady, finishing with 16 points in the quarter. Moore preached effort after the contest, saying that his team needed to bring the defensive energy more consistently if they hope to continue their early-season winning trend. Even with the defensive issues, the Lady Bulldogs nearly made up a 51-47 deficit in the final 1:30 of regulation. After a Grandview steal, Reynolds swished a three-pointer to bring the Bulldogs within one. Chrisman charged down and answered with a bucket, and then a critical Grandview turnover on the subsequent possession allowed the Bears to open up a 55-50 lead with 22 seconds left. Reynolds, who finished with 11 points, still wasn’t ready to concede defeat. She rushed the ball down the court again and swished her third three-pointer of the game, this time from several feet beyond the arc. With less than ten seconds to play, the Bulldogs were in striking distance, at 55-53. Grandview immediately fouled after the inbounds pass, and Chrisman missed the ensuing free throw to keep the final outcome in doubt. But as time wound down, the Bulldogs raced down the court without the benefit of a timeout. Senior Drea Lesure could only get off a running three-point attempt at the buzzer, and when the shot careened off the backboard, the game was over. Grandview’s winning streak had been snapped at nine games, and the Lady Bulldogs would not be winning their second consecutive tournament trophy. But Moore said that despite the loss, there would be much to learn from the contest. “We’ve got to pick ourselves up, dust ourselves off, and come out here tomorrow ready to play a basketball game,” said Moore. The Bulldogs appeared to learn something from the tight loss. Grandview finished the tournament on Saturday with a match-up against St. Teresa’s. In that game, Grandview raced out to a 22-5 first quarter lead and never allowed a significant run in pulling out a 61-31 win. The Lady Bulldogs moved to 9-1 with the victory.